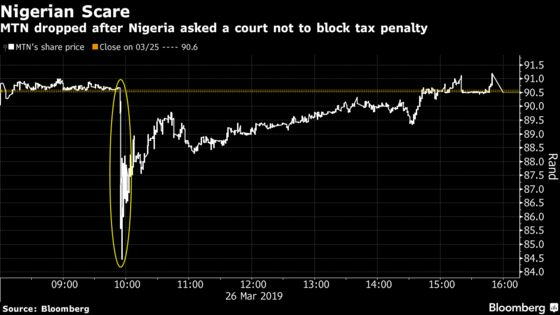 (Bloomberg) -- Shares of MTN Group Ltd. recovered from their biggest decline in more than five months to close little changed in Johannesburg trading as Nigeria’s government urged a Lagos court not to block a $2 billion penalty it imposed on the mobile carrier for allegedly evading taxes. Wole Olanipekun, a lawyer for MTN, said Nigeria’s attorney-general, who inflicted the penalty, had no right to do so. MTN has previously denied it didn’t pay taxes properly in the West African nation. The case was adjourned until May 7. MTN fell as much a 6.8 percent, the most since Oct. 5, before paring losses to 0.1 percent by close in Johannesburg. MTN’s share price has fallen 16 percent since it was hit by a double Nigerian penalty in mid-2018. The Central Bank of Nigeria first ordered it to transfer $8.1 billion of repatriated dividends back to the country, before the attorney-general announced the measure on taxes. The company settled the former dispute in December, agreeing to send back $53 million and clearing itself of any wrongdoing. MTN plans to list its Nigerian unit, which has 58 million mobile-phone subscribers, in Lagos once the tax issue is resolved. It will be the biggest company on the bourse by revenue, having made sales of 1 trillion naira ($3 billion) last year.